Scott Frost signed wide receiver De’Mariyon Houston today, finishing off his first full recruiting class at Nebraska. It’s the largest class the Huskers have signed since 2008. I peg the 26-man class No. 17 nationally, while the Huskers ended up ranked No. 16 (Rivals), No. 17 (247 Sports) and No. 19 (ESPN) by the national recruiting sites. In his short time in Lincoln, Frost has lived up to his billing as an elite recruiter. He had a strong reputation at Oregon, where he was regarded as one of the best recruiters in the Pac-12 during his time as an assistant in Eugene. Frost exceeded expectations last season. Despite only being on the job for roughly 9 weeks – over 3 of those falling during a recruiting dead period – Frost signed a class that finished 22nd according to the 247 Composite, tied for the highest rated class Nebraska had signed since 2011. Regime changes typically turn first signing classes into a mad scramble, but Frost hit the ground running. The energy and focus he and his staff displayed was nothing short of extraordinary. I was extremely impressed with how organized they were right out of the gate when they arrived last December. In all, Frost added 19 players to accompany the five holdovers from the previous staff. Twelve of them were rated as a four-star recruit by at least one recruiting service. Recruiting and building a roster is so much more than ‘sign as many four-stars as you can.’ It goes without saying coaches will try and get the most talented players possible. But those kids have to fit the culture of your program. Another factor often overlooked by the casual observer is the schematic fit. What’s the point of signing a four-star high school defensive end to play outside linebacker in your 3-4 if he can’t play in space? Does it matter if you sign a four-star cornerback if he specializes in off-man or zone, and you generally play press-man? If you’re a zone blocking team, why recruit a kid if his forte is playing in a gap scheme? I think Frost is outstanding in this capacity. He checked a lot of boxes on his to-do list with the 2019 class. He had a year to get to know his team and see where they needed to improve. Frost and his assistants have been forthright in what they needed to address on the recruiting trail. Looking at this class, they must be really happy with their efforts. They added several skill position players on offense who are dynamic athletes and homerun hitters. Guys who can play multiple spots and be used all over the field to create mismatches. On defense, they signed several players who bring the sort of size, length, and athleticism they want. Defenders who can be used in hybrid roles depending on the opponents formation, scheme or alignment. Luke McCaffrey is a raw prospect with a very high ceiling. He had not been a full-time starter at quarterback until this past season. 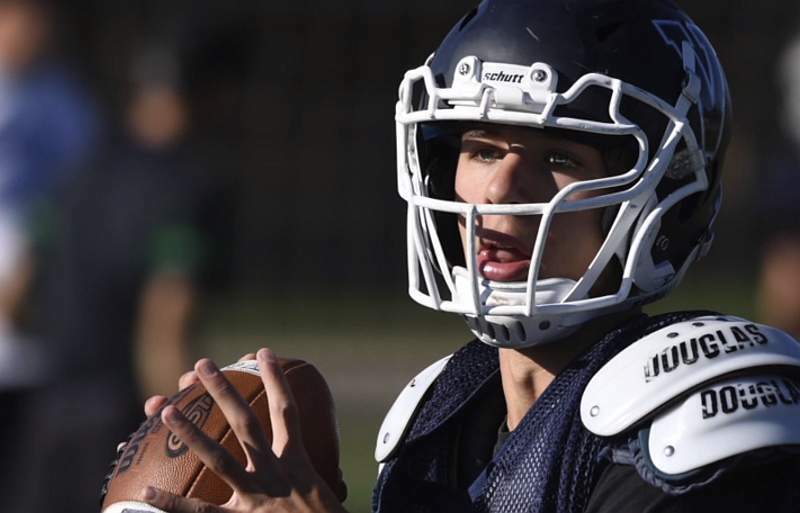 He spent his first three years waiting behind his brother Dylan, a five-star recruit now at Michigan, and Blake Stenstrom, a four-star prospect now at Colorado. While waiting for his turn as the full-time quarterback, he saw time at wide receiver, safety, running back, cornerback and as a return man. McCaffrey is a gifted athlete who also played basketball, lacrosse and ran track. At The Nike Opening Regional in Dallas this past April, McCaffrey ran a 4.64 in the 40-yard dash, posted 4.27 seconds in the 20-yard shuttle and recorded a 30.7-inch vertical jump. Frost offered McCaffrey back on March 26, 2018. He ended up taking an unofficial visit shortly after on April 7 for Nebraska’s second Junior Day. Then during the spring evaluation period, quarterbacks coach Mario Vercuzco went out and watched 12 quarterbacks throw in person. Reportedly, what he saw from McCaffrey was as good as any prospect he watched in person. Following the performance, McCaffrey was given the green light to commit. A few weeks later, on June 4, he did just that. He chose the Huskers over offers from Ohio State, Michigan, Washington, UCLA, Ole Miss, North Carolina and Virginia. Despite limited starting experience, McCaffrey has shown nice pocket awareness, good decision-making ability and is efficient going through his progressions. Athletic high school quarterbacks like McCaffrey tend to tuck the ball and run if they are flushed from the pocket or their first read isn’t available. McCaffrey does a very good job of extending the play with his feet, moving laterally and keeping his eyes downfield when the pocket collapses. He’s an accurate passer with the arm strength to stretch defenses. The 6-foot-2, 185-pound McCaffrey is a true dual-threat quarterback that can make plays with his arm as well as with his legs as a runner. The sort of quarterback tailor-made for Frost’s system. He’s adept at running the zone-read and executing the RPO plays that are staples in this offense. McCaffrey is dangerous with the ball in his hands and has the speed to run past defenders in the open field. He fits the mold of other Frost guys like Marcus Mariota, McKenzie Milton and Adrian Martinez. This past season, McCaffrey led his Valor Christian (CO) High School to a perfect 14-0 record and a Class 5A state championship. He threw for 2,202 yards with 21 touchdowns versus only four interceptions. He also ran for 526 yards and eight touchdowns and averaged nearly 6.5 yards per carry. Despite splitting time as a junior, McCaffrey was named a first-team All-Colorado choice as a quarterback by the coaches association, and was a first-team all-state pick by the Denver Post as an Athlete. McCaffrey was ranked as a four-star prospect and the nation’s No. 141 overall player by ESPN. He was also regarded as the top prospect in Colorado by both ESPN and the 247 Sports Composite rankings.